Having just watched the 6-hour retrospective documentary on Monty Python, I find it hard to imagine, 40 years from now, a new generation of comedians recalling how groundbreakingly, subversively funny Broken Lizard was. At their best, Broken Lizard may be groundbreaking, but they’re almost never subversive, which most of the time just leaves funny. Broken Lizard is five funny men who met in college and continue to write and star in film comedies. My first exposure was their 2000 release Super Troopers in which the troupe play state troopers abusing their authority as they to try to liven up their boring lives. Most of their films were directed by Jay Chandrasekhar, whose absurdist sensibilities usually strike the right tone for me. The Vermont troopers test their machismo by challenging each other to maple-syrup-chugging contests. It’s a ridiculous, yet completely effective gag (pun intended). Even the widely panned Dukes of Hazzard movie has a man riding a safe dragged from the back of a pickup truck as alcohol-fueled absurdist fun. 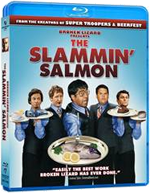 Slammin’ Salmon is directed by Kevin Heffernan, not Chandrasekhar, and his sense of humor runs far more conventional; it’s mostly situational comedy aimed at the college or post-college crowd. The setting is a Miami restaurant owned by a former boxing champ (Michael Clarke Duncan) whose head injuries justify some funny non-sequiturs. His manager (Heffernan) tries to balance the boss’ unpredictable demands with the waitstaff’s limited patience. Tonight, for example, the crew has to bring in more money than they’ve ever made before, or the champ will lose the restaurant. The manager invents a prize for the waiter who brings in the most money, which motivates the cartoonish characters to do their funny stuff. Chandrasekhar bring his absurdist sensibilities to the waiter whose meds were so perfectly balanced that daylight savings time throws him out of whack. Heffernan brings scatological humor to the manager who accidentally swallowed a patron’s engagement ring intended to be served in the dessert. Another waiter (Steve Lemme) was an actor rejected by Hollywood after his nose job made him too normal for the screen. I’m glad to see Broken Lizard sticking together and making movies. They’re no Monty Python, and these days, nobody is. Still, a comedy troupe offers a halfway point between between endless TV shows set in the same universe (think Reno 911) and one-off comedies with nothing more than the hero/sidekick/girl ingredients. The Slammin’ Salmon is pretty far from their best work. But I won’t pan it too harshly because, after all, they’re my favorite guilty pleasure. Let’s just say that The Slammin’ Salmon is mostly for friends, fans and completists. The Slammin’ Salmon looks like it was shot on video, not film (a very strong possibility). The picture quality is very clean, of course, but the lighting looks like a TV studio. Sound quality is fine, although it’s mostly dialogue; nothing too taxing there. Lower expectations. Watch movie. Enjoy anyway.